Southern Oregon overcame an eight-point deficit in the final minute of regulation to force overtime, but No. 15 Warner Pacific held on for an 82-78 victory over the Raiders Wednesday night in a Cascade Collegiate Conference men’s basketball tournament quarterfinal game. 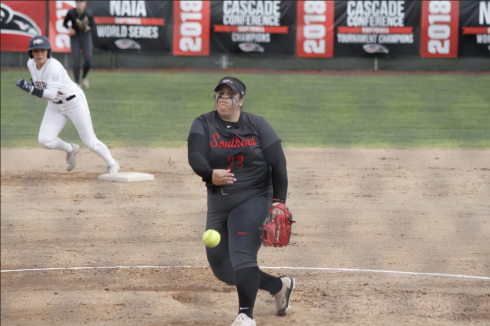 Southern Oregon finishes the season with a 17-13 overall record, while Warner Pacific improves to 23-7 overall. The third-seeded Knights will travel to Kirkland Saturday for a semifinal game against No. 2 seed Northwest. Kyle Tedder tied an SOU record with nine three-pointers in the game as he tallied a game-high 33 points. Tedder made 9 of 14 shot attempts from beyond the arc and 11 of 16 from the field overall in the contest. Eric Thompson posted a double-double with 17 points and 12 rebounds and Jordan Highland added 10 points for the Raiders. Biniam Tadele led Warner Pacific with 18 points and eight rebounds. Dane Johnson added 14 points and eight assists. Traevone Bowie finished with 13 points, Doug Thomas tallied 12 and William Sharp posted 10 in the win. 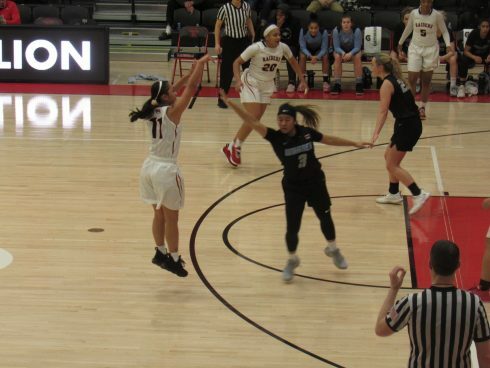 Southern Oregon held a 33-29 lead at halftime and led 50-42 with 10 minutes remaining before Warner Pacific used a 17-1 run to take a 59-58 lead into the final 35 seconds. The Raider offense came back to life at the end of regulation to force overtime, and SOU led by two points for most of the overtime period. Tedder hit a three-pointer to cut the lead to five, and Joe White followed with a bucket to make it 66-63. Following a WPC free throw, Tedder sank another three and made the and-one to pull SOU even at 67-67. The Knights had a pair of opportunities in the closing seconds but could not make a layup as the game went into overtime. Tedder opened the overtime period with a three-pointer to put SOU up 70-67, but the Knights responded with a 4-1 run to tie it up at 71-71. White made a pair of free throws to put SOU back on top, but Tadele made a layup to tie it up again. The Knights took their first lead of overtime with 1:10 to play when Tadele hit a trey to put WPC up 76-75, and the hosts followed with three free throws to take a four-point lead with 21 seconds remaining. Tedder hit his ninth and final three-pointer of the night with 15 seconds to go to pull SOU within one, but Dane Johnson made a free throw and the Raiders turned the ball over twice in the closing seconds to seal the game. Tedder’s nine three-pointers tied the SOU record for a single game, set by Lee Smith against Western Oregon on Jan. 30, 1993. The loss marks the final game for the four seniors on the 2011-12 team: Highland, Sam Osofsky, White and Scott Tiefenthaler. Southern Oregon shot 46.7 percent for the game (28-of-60), while the Knights hit 42 percent of their shots (29-of-69). The Raiders out-rebounded WPC 48-36, but SOU finished with 27 turnovers in the loss while the Knights gave the ball away only 12 times.